Plan seasonal menus, special events and customer offers with confidence! 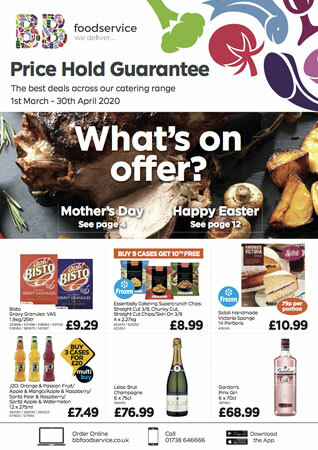 Catering Deals features a wide range of top quality products available for direct delivery to your business, all offering market-leading value. You'll find fresh, ambient and frozen foods, the leading drinks brands including licensed products, and a wide choice of non-food lines, including our exclusive Essentially Catering and Essentially Cleaning ranges. Catering Deals runs for a 2 month period only and features products geared to the season, enabling foodservice operators to serve up competitive menus and deals to customers right through the year. A one-stop shop for everything from beer to cocktails! With customers enjoying a wider choice of drinks than ever before, Drinks Express is the delivered specialist service for licensed trade operators. You’ll find everything from the leading beer and cider brands to the latest craft products, a comprehensive wine range including our own exclusives, and everything you need to make great cocktails, including spirits, mixers, juices and syrups. Along with soft drinks and bar accessories, Drinks Express delivers everything needed for a profitable licensed drinks operation, including products not available in depots.